Weeding the non-fiction section is an opportunity to refresh the collection, see what subjects are the most sought-after in the reading community, and to good-naturedly mock some of the more outdated books that somehow remain hidden on the shelves. 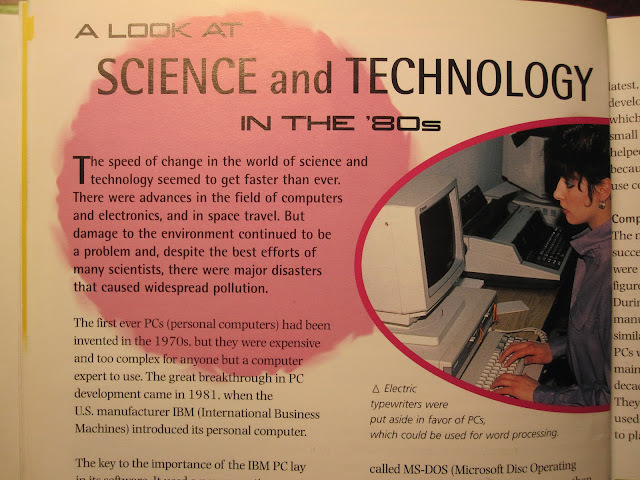 I recently found two books (published in the year 2000) that provide a look at life in the 1980s and 1990s. Although shabby and nearing obsolete, the books themselves aren't bad, and they give us an amusing glance at what used to be considered modern. (Also, FUNNY PHOTOS - see below). Although some parts made me cringe (fashion in the 90s, anyone? ), this "read down memory lane" made me think. When we consider the eighties and the nineties (and preceding decades as well, but I wasn't alive then, so they don't matter to me, HAHAHA), there is a certain feeling to each that identifies them as their own encapsualted entity. Do we have that same feeling about the years 2000 to 2010? Will the kids who were born in this decade look back with nostalgia and say "Remember the Aughts? Those were good days!" Obviously, I'm not saying nothing important happened in that decade (I think we can all agree that it was world-changing), but to me, its "identity" seems to be blending in with this current one in a way that doesn't seem to have happened before. Is it the influence of the Internet? Are we simply processing information differently now than we have in the past? Or am I just too old (and therefore too removed) to appreciate the nuances? I guess time will tell. For now, I'm just going to make fun of how we were in the days of yore. Here are few of my favorite photos from the two aforementioned books. That poor, lonely, cast-aside electric typewriter would feel better if it knew it would come back into fashion again thanks to hipsters and writers who like to remain "old school." 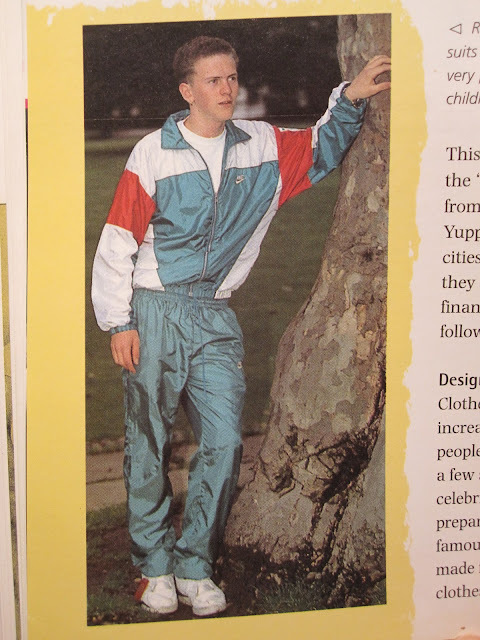 The caption in the book was "Running suits became very popular for children and adults." This guy actually had to tuck in the jacket of his running suit because he ran THAT HARD. 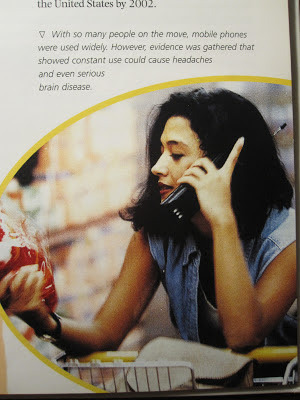 Excuse me, miss, Zack Morris would like his cell phone back. 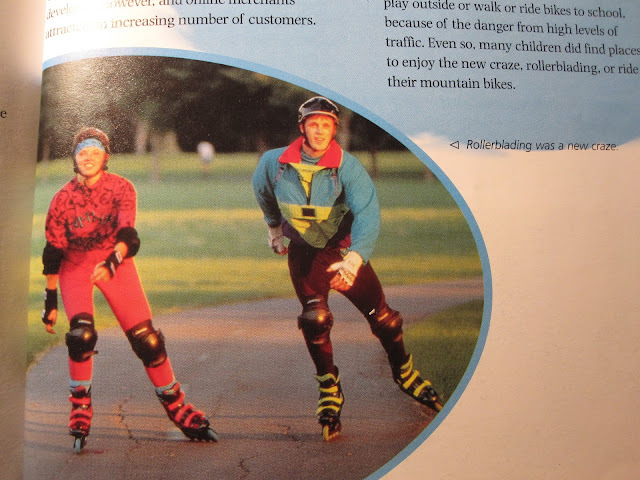 These rollerbladers are crazed! CRAZED, I tell you! Oh man, I cannot get over the return of blunt bangs and skinny jeans... WILL WE NEVER LEARN?? In looking at the elastic in the photo, it doesn't look to me like his running jacket is tucked in to his pants; it looks like the bottom of the jacket just meets the top of the pants. I seem to remember hearing that Deion Sanders had his Dallas Cowboys uniforms specially tailored so the top would JUST meet the bottom, as he didn't want to tuck it in or something like that (in order to meet NFL uniform rules). the matching outfits do prove the rollerbladers are indeed crazed. That's funny! I'd be interested in reading that. I was born in 1974 so those pictures really bring back memories! I think we're just not far enough removed yet from the 'Aughts' to be able to discern them from the current decade. As far as the heated debate above on whether or not that dude's windbreaker is tucked in, he is just way too cool leaning up against that tree to CARE what his outerwear is doing. How sad is it that my library had titles like this from the 80s and 90s exclusively. My favorite titles were all about proper lady grooming and hairstyles.